Visiting delegates from Accra and Takoradi and local officials and supporters of the newly built Dagbamete Medical Centre. 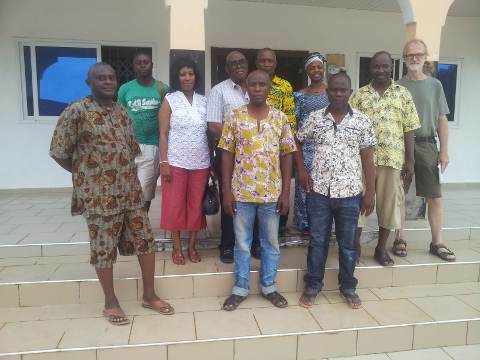 Pictured in the front row are project secretary Sammy Davor, shrine priest Kofi Amenorhu, businessman Mensah Avorgbedor. In the back row are businessman Bright Davor, the three visiting delegates Doreen d'Almeida, Selassie d'Almeida, and Dr Jack Galley, Queen Mother Mama Adzorhlor III, project co-ordinator Simon Nerro Davor, and businessman Conrad Richter. The Dagbamete Medical Centre clinic building, built in 2014. 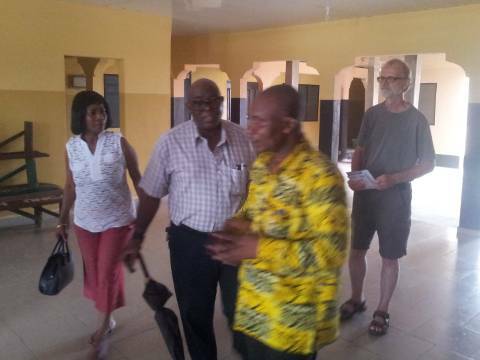 Delegates Doreen d'Almeida, Selassie d'Almeida, and Dr Jack Galley inspecting the clinic facility. Also pictured is Conrad Richter who is part of a team of three that is arranging for donated medical equipment to be sent from Canada. 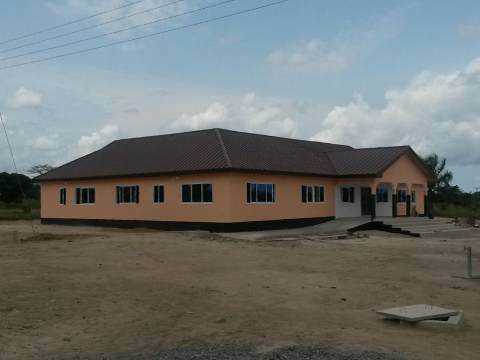 A newly built clinic in Dagbamete was visited by a delegation of three from Accra and Takoradi for discussions on what steps must be taken for the clinic to become fully operational. Visiting were Selassie d'Almeida of the World Health Organization Ghana in Accra, and his wife, and Dr Jack Galley of Benedict Hospital in Takoradi. The Dagbamete Medical Centre was built in 2014 but so far it is only offering limited services, lacking the equipment and staff needed to provide full services for Dagbamete and surrounding area. It has a community health practitioner and a clinical nurse but has not yet hired a doctor and other staff needed to operate as a fully functioning clinic. Though it is not registered with the Ghana Health Ministry or accredited with the National Health Insurance Scheme, applications for both have been submitted according to project co-cordinator, Simon Nerro Davor. The visit on November 7 came at the invitation of Mama Adzorhlor III, Queen Mother of Dagbamete, who along with her husband, Conrad Richter, met with Mr d'Almeida and Dr Galley the previous day at the WHO offices in Accra. The delegation was received by Mr Davor along with his brother, Kofi Moses Davor who built the facility buildings. Other local officials and supporters of the project were in attendance as well. Major topics of discussion were whether the facility should offer services in traditional medicine as well as orthodox medicine, whether it should hire a full-time doctor or invite visiting doctors from nearby hospitals, and what equipment and furnishings the clinic still needs in order to become fully operational. Dr Galley offered suggestions on how best to utilize the various rooms with a view of creating an efficient flow of patients through the facility. His experience in founding the Benedict Hospital in Takoradi, a successful private hospital, was quite apparent. Mr d'Almeida urged the clinic project organizers to develop a business plan with a view to make the clinic financially sustainable in the long term. Both Dr Galley and Mr d'Almeida were visibly impressed with the facility and the work of the project organizers. Dr Galley said that with the acquisition of furnishings such as a delivery bed, tables, chairs, and basic equipment such as weigh scales, stethoscopes, thermometers, wheel chairs the clinic can soon become fully functional. Already good quality hospital beds and electrocardiogram equipment have been acquired which Dr Galley inspected. The equipment was sent by village chief Torgbui Klu Agudzeamegah II who resides in London. Dr Galley also strongly suggested that a laboratory be set up for blood, urine and stool testing. He offered to provide a list of equipment needed for a basic laboratory which will save valuable time in the diagnosis of diseases such as malaria, diabetes, and worms. With help from Canadian doctor Robbie Chase, The Queen Mother of Dagbamete, Mama Adzorhlor III, and her husband Conrad Richter, are arranging for a container of medical equipment and supplies to be sent from Canada in 2016. These items will go a long way toward filling the equipment gaps identified by Dr Galley. The items will be donated by a Canadian charity, International Hope Canada. Procession of chiefs and other dignitaries to the festival grounds at the Second Annual Atsyiame Clan Festival held recently in Dzogadze. Dignitaries seated at the festival grounds. Women adorned with beads and cowrie shells bringing traditional items representing the wealth of the ancestors. Clan chief Torgbui Samlafo IV of Avenorpeme addressing the crowd. With him are host Torgbui Agbla III of Dzogadze (far left), secretary Samuel D.K. Davor of Dagbamete (holding microphone) and Torgbui Klu Agudzeamegah II of Dagbamete, the 2014 festival host (left). Clan historian Simon Nerro Davor of Dagbamete recites the Atsyiame clan lineage. With him is clan linguist Kordzo Dzeamesi of Dagbamete. The second annual festival of the Atsyiame Clan, the Atsyiame Hlor Tutuza, was held in Dzogadze on October 24. The day long festival attracted an estimated 1,000 people, including many clan chiefs and other dignitaries. Festival goers were treated to traditional music and dance, and frequent blasts from 19th century muskets fired by the Asafo warriors. Host Torgbui Agbla III of Dzogadze and Clan Chief Torgbui Samlafo IV of Avenorpeme, along with last year's host Torgbui Klu Agudzeamegah II of Dagbamete, welcomed the guests. In a speech, Torgbui Samlafo called for the people of Dzogadze to continue to preserve the traditional Atsiagbekor war dance of which the village is an acknowledged custodian. He called for the government to assist in the upgrading of roads linking Akatsi, Dagbamete and Avenorpeme and roads linking Dzogadze, Atidzive, and Ayitikope to Gefia, and called for the government to dredge silt from the Dzogadze Dam. He urged members of the clan to support a newly created education fund to help brilliant children of the clan who are needy. He also urged clan members to curtail the tradition of putting on overly elaborate and expensive funerals so that money can be more profitably used for education and economic development. The audience heard from Bernard Ahiafor, Member of Parliament for Akatsi South, and from the District Chief Executive of Akatsi South, Samuel Kodzo Wuadi. Clan historian Simon Nerro Davor of Dagbamete gave a detailed recitation of the Atsyiame clan lineage going back many generations. Through his and many others' efforts the clan lineage has been documented going back thirteen generations, spanning more than 300 years, all the way to the founders Adelamatsi and his son the great Torgbui Gbedorku. The village of Dagbamete was host of the inaugural Atsyiame festival in 2014. The festival was founded to reunite the branches of the clan and to foster unity and development, and to promote peace within clan areas. Members of the Atsyiame clan are found throughout the Avenor Traditional Area, in more than 60 towns and villages founded by descendents of the clan founders. The location of the 2016 festival has not yet been decided, but Avenorpeme has been mentioned as a likely possibility. Following the announcement by the Ministry of Education to construct a satellite campus of the University of Health and Allied Sciences in the Southern Volta, the chiefs and people of Dagbamate and its surrounding villages in the Akatsi South District have pledged to willingly release the 10 acre piece of land for the project. 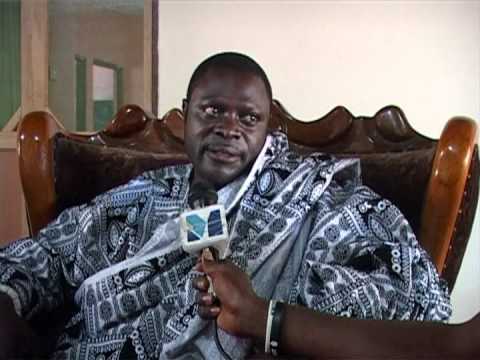 At a press conference, the chief of Dagbamete Torgbui Klu Agudzeamegah II said the community over the years through communal spirit spearheaded developmental projects such as construction of classroom blocks, a health center, and free accommodation for health workers in the area to augment government efforts. He said the location of the proposed the land is conducive for academic works. "The chief and elders of the community and its surrounding villages want to assure Government of their willingness to go to any length to support the project. We believe that this offer from the people of Dagbamete will enhance the fast execution of the establishment of the campus" he said. The University Health and Allied Sciences is the first publicly-funded state university in the Volta region. The University currently operates five schools namely, School of Basic and Biomedical Sciences sited in Sokode, School of Nursing and Midwifery and School of Medicine in Ho and School of Public Health and School of Allied Health Sciences in Hohoe. The School of Pharmacy has been earmarked for construction in the southern part of the Volta region.